Interested in learning how to become a Drupal themer and front-end developer, too? Check out our role-based learning pathway: Work with Drupal Themes and Front-End. 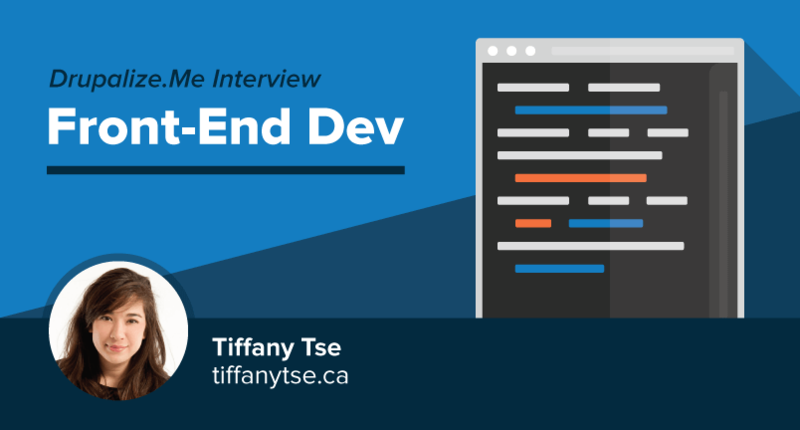 How do you define the front-end developer role? How does being a front-end developer relate to being a Drupal themer and vice versa? I currently work as the Creative Director for Coldfront Labs Inc., and I oversee all design and front-end development for client projects. This includes art direction, style guides, and product development. I’m also responsible for the UX strategic direction for the company, and teaching insight regarding our corporate training programs. A typical day starts with a standup, discussing ongoing projects and upcoming tasks for the day and week. Depending on which clients we’re working with, I’ll do a variety of things, such as designing prototypes, workflows, UI components, mockups and graphics, to implementing an existing design and theming a site or interface. I also conduct client meetings, review existing designs and markup, research new development/design techniques, or create curricula for our training courses. In addition to working with Coldfront Labs Inc., I also teach web development, usability, and motion graphics at Algonquin College in the Graphic Design diploma program and Interactive Multimedia diploma program. I’m passionate about inspiring young designers and developers, and serve as the Ottawa chapter co-lead for Ladies Learning Code. These workshops act as a resource for women and youth, helping them to become passionate builders of technology—not just consumers—by teaching technical skills in a hands-on, social, collaborative way. My team looks to me to “make things pretty," but I think my contribution reaches further than that. I believe that I do a lot to drive the direction of projects, in terms of how an application works with a user, and what the actual design of that application will be. Working with clients and being able to express our expertise while maintaining their vision isn’t easy, but it’s something we do every day. I move us through this process, and help to build beautiful websites and applications. I would say my strongest skill is my leadership expertise. It represents how I design, develop, and build applications with my team, and how I approach my career. Being able to drive the direction of a project, clearly expressing ideas, and inspiring others is an invaluable skill. For me, being a leader comes quite naturally. I like being in control of a project and knowing all the moving parts so I can make informed design decisions. Over the years, I’ve watched mentors, teachers—people who are smarter than me—and learned from them. I looked at what they did well and figured out how they did them. I have always loved art, design, and problem solving. In high school, I remember playing in Photoshop, building websites (with geocities!) or customizing the look of my LiveJournal or MySpace page. I went to University for Fine Arts and when I finished my bachelor’s degree, I went to college for an Interactive Multimedia post graduate certificate. It was there where I really learned how to code, and understand how I could put my interests together. What is most challenging about being a front-end developer/Drupal themer? I would say Google is probably my best friend when it comes to everyday work. The moment I don’t understand something, forget programming syntax, or have a question, I Google it. Outside of being able to teach yourself how to do something, Grunt coupled with guard-livereload and Sass are the cornerstone of my day-to-day workflow. When we are looking to create quick prototypes, we use http://uxpin.com. Adobe CC with the plugin GuideGuide for Photoshop is also really useful. If you were starting out as a front-end developer/Drupal themer all over again, is there anything you would do differently? I think I would try making more for-fun projects, like small applications that do some specific task, or small websites that would help me to learn a specific language or front-end development tool. That, and I wish I would have blogged more about what I was learning while I was learning it. What advice do you have for someone just starting out as a front-end developer/Drupal themer? My advice would be to get into the community of developers (wherever you are) as soon as you can. Find a meetup group, look for a coding club, or join a co-working space, so you can connect with other developers and designers quickly, and build your professional network. It’s important to connect with people you can ask questions when you are starting out. Building a solid network of people that you trust, that you like being around and that are super smart, is a great way to push yourself to keep learning and create the potential for opportunity. Very Inspiring!! can you please suggest some groups or sites or coding club where i can join? I would also suggest checking with your local library for community events and of course a good Google search can go a long way.